Android version 6.3.12 is now available on Googleplay for all Deeper users, and it offers new features and improved performance on the Deeper App. These include the return of fish sizes on the sonar display, plus smoother performance with mapping, boat mode and in history. 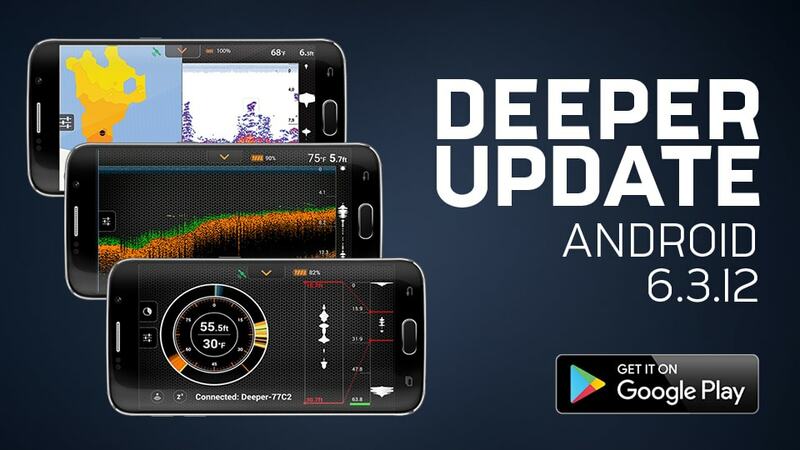 Download the update today to get even more from your Deeper Sonar. The fish sizes feature is now back on the Android version of the Deeper App. To get approximate sizes for the fish you’re marking, just enable Fish Icons using the left hand menu, and any icons will be show in one of three sizes – small, medium or large. Just remember these icons are only a guide. The most accurate way to distinguish the size of a fish is using the ‘detailed’ sonar display and looking for clear arches to show fish. Getting the latest Android upgrade will also improve the performance of a range of functions in the app. Opening history items should now be smoother and faster. When mapping in boat mode and Onshore GPS mode, previous sessions for the same location will now be visible while you are mapping new areas in real time. We’ve also improved the performance of the speedometer in Boat Mode and of the depth alarm feature. Fish sizes now available when using fish icons. Smoother functioning in history mode. Previous sessions visible when making new bathymetric maps. Improved connection for Nexus 7 users. Improved resolution for Samsung Note 3 users. Improved performance of speedometer in Boat Mode. Smoother operation of depth alarms. To get the new version of the Deeper App, go to Googleplay.